This release came out on Record Store Day 2012. The a-side is an edit of the 6:36 Sparks remix originally released in 2006 on the various artists compilation "Future Retro". 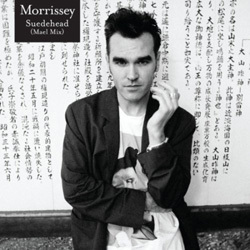 For information on the original 1988 edition of "Suedehead", see here. Morrissey in Japan, taken by Kevin Cummins in 1991. 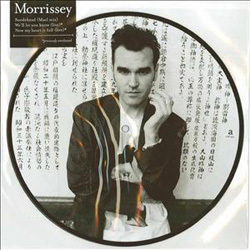 UK: The release was promoted with the help of a 3-track cd-r dispatched with an insert inside a clear plastic sleeve. This promo is actually the only compact disc source for the material from this vinyl-only release. The insert has release identification in black and a red EMI logo on its front and the track listing, a red EMI logo, copyright and promo warning on its back. The disc is white with black text and logo.